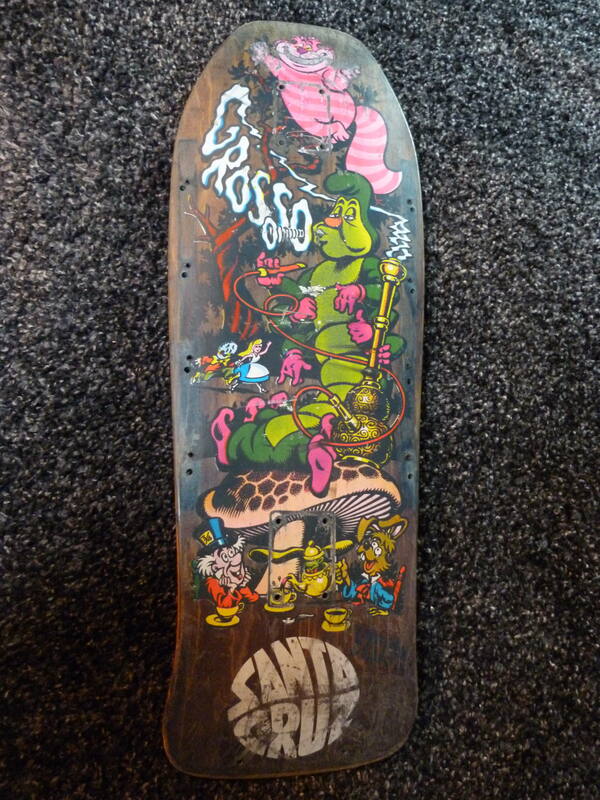 SkullandBonesSkateboards.com ~ View topic - used Grosso Alice for ?? SkullandBonesSkateboards.com Forum Index » WANNA' TRADE? » used Grosso Alice for ?? used Grosso Alice for ?? At some point, I was considering to sell this... but that won't happen. I could see let it go for something else, though - a used Powell pig or a Zorlac Metallica pirate, for instance. a PP Steadham or a Skull & Sword would excite me... a vato rat as well, of course. reds are preferred. but I'll consider other stuff as well - anything that would make me dream of an early- to mid-80s session at Del Mar or something like that. piggy shape. not looking to sell at this point. I love this deck more than cash on my account. But if there's a chance of finding something new to hang, I'll let it go. hmmm...not so much going on... still - BUMP!! not really looking for those, but feel free to send a pic anyway... I wonder what the pirate looks like. Did you move your Alice? I've got an '81 Mullen freestyle Mutt. Interested? damn - sorry for the late reply - but the Alice was on hold. Kind of. Need to get back in touch with the potential buyer and see what he's up to.